MARKHAM, ON, (Aug. 13, 2018) – Building on the highly acclaimed 10th-generation Civic lineup and offering customers more of what they love about the model, the refreshed 2019 Honda Civic Sedan and Coupe include updated styling, and a new Sport trim for both body styles. 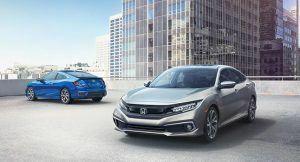 The updated Civic Sedan and Coupe are the latest salvos in the 10th-generation Civic’s aggressive launch cadence that has launched five new variants since the Civic Sedan launched in the fall of 2015. Civic is targeting its 21st consecutive year as Canada’s best-selling passenger vehicle. The 10th-gen Civic’s aggressive and sporty design is one of the most liked attributes among Civic buyers and the 2019 Sedan and Coupe turn it up a notch with evolutionary styling updates, front and rear. Changes at the front further accentuate the model’s low and wide athletic stance and sporty good looks with a new piano black upper fascia “wing,” restyled lower fascia, bumper and lower grille, a full-width front splitter, chrome side pod accents, and updated halogen or LED headlights. A chrome accent on the lower rear bumper of the Sedan and new wheel designs for both models – including larger 18-inch rims on the Touring trim – round out the exterior styling updates on the returning trims. The new Civic Sport trim, positioned between the EX and Touring, offers the looks and features enthusiasts are looking for. Civic Sport’s increased attitude comes from a piano black lower front fascia, side pod accents and, for Sedan, an added rear decklid spoiler, plus a splitter-style rear lower bumper incorporating a chrome polygonal exhaust finisher similar to Civic Si. Larger 18-inch (+1 inch) 10-spoke alloy wheels with Belrina Black finish complete the Sport’s more aggressive look. The Sport trim features a high-revving 2.0-liter 16-valve DOHC VTEC® engine mated to either a smooth and efficient CVT with G-Shift Control or a slick-shifting 6-speed manual. Adding more tech to the Sport, the new trim receives the updated 7-inch Display Audio with Apple CarPlay™ and Android Auto™ integration and volume button. With even more features, the refreshed Civic Sport includes Honda’s Lanewatch and a moonroof. Advancing Honda’s commitment to make Honda Sensing® standard equipment on all vehicles by the 2022 model year, all trims of the 2019 Civic Sedan and Coupe from DX to Touring feature Honda Sensing® technology, which includes Collision Mitigation Braking System™ (CMBS™) with Forward Collision Warning; Road Departure Mitigation (RDM) incorporating Lane Departure Warning (LDW); Lane Keeping Assist System (LKAS); and Adaptive Cruise Control (ACC). First introduced in the fall of 2015 in Sedan and later Coupe form, the 10th-generation Civic lineup includes the European-inspired Hatchback, the performance-focused Civic Si Coupe and Si Sedan and the world’s fastest front-wheel-drive car, the Civic Type R. Since its introduction, the 10th-generation Civic has amassed dozens of major industry awards and accoldades including the 2016 AJAC Car of the Year, 2016 North American Car of the Year award, 2017 Kelley Blue Book Overall Best Buy of the Year, 2018 Car and Driver 10Best and 2018 AUTOMOBILE All-Stars award. The Civic’s 1.5-liter VTEC® Turbo and 2.0-liter VTEC® engines are produced in Anna, Ohio and Alliston, Ontario.